Whilst the Power Dive single person Deck Snorkel Hookah affords boat owners easy access to their hull and running gear for emergencies and maintenance chores, the Double Deck Snorkel literally doubles the functionality and fun of your Power Dive unit. 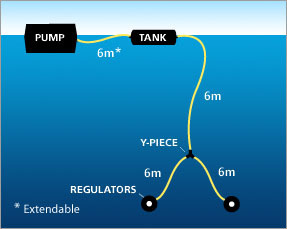 You can now buddy dive under your boat for your maintenance chores or recreational dive with family and friends to 6 metres (or solo dive to 12 metres) from your boat, dinghy or inflatable. 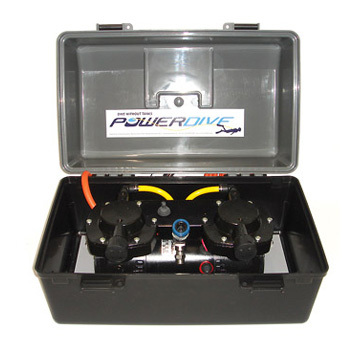 Dive time with the Double Deck Snorkel is only limited by the size of the battery you choose to connect to. A standard 100 amp hour battery will last up to four hours, however, if you have means of charging batteries on board your boat you will have unlimited dive time.